How to create a winning Fuzu CV - Ivy Kunihira, SafeBoda. Until a potential recruiter meets you in person, your CV is the only thing that represents you. Unfortunately, some job seekers don’t invest in making their CVs appealing to stand out which makes many applicants get dropped out at the application stage due to poor quality applications. 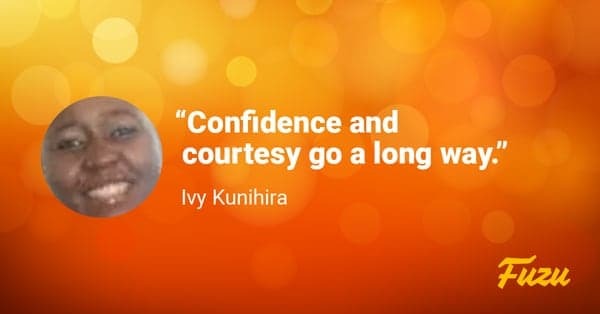 SafeBoda’s Ivy Kunihira shares some basic principles on how to create a Fuzu profile that will help you beat your competition. How did you get to know about Fuzu? You happen to be one of the many Fuzu users who’ve successfully gotten a job. How was the application process for you? Easy. I simply used the CV already uploaded on my FUZU profile to apply for the job. Took a few minutes. What’s your favorite thing about company SafeBoda? Any exciting memories so far? SafeBoda is a cool place to work. It’s a fast growing company and the ever changing environment simply means one has to be open to change and challenges. That’s exciting, right! Are there any secrets you used that could also help other job seekers get a job? Or what advice would you give job seekers? Sign up to Fuzu and take steps towards your dream career. Thank you so much Ivy for the inspiring story/advice.